“Oh my gosh, what happened to your bike? It’s wrapped around a pole! How did you even do that?” “Actually, it is my new bike lock. It is designed to wrap around the pole.” Seriously, I have seen bikes that were hit by cars that sort of look like the invention of Mr. Kevin Scott. Scott has figured out a way to make the frame bars of an ordinary bicycle super flexible, so they have the ability to bend around a pole. I suppose you would have to be a biker to appreciate something like this, because it would make it nice to use one of those horseshoe-shaped locks to lock the two back wheels in place. It would appear that the lever locks and unlocks them into place, but you don’t want to be the poor guy who is riding down the street and accidentally hit it. Then you might end up looking as if you crashing into a lamppost. 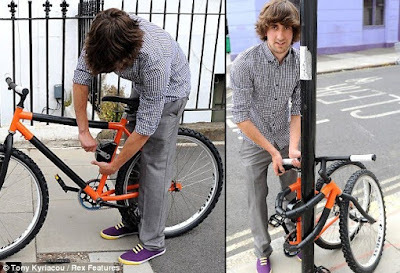 This is still just a concept from the inventor now, and if it is going to be the new standard for bicycles, then bikeracks as we know them are going to have to change.